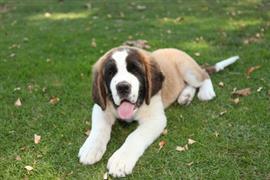 Coming from the Swiss Alps, the Saint Bernard gives new owners a variety of origin based names to choose from. Italian options include Gianni, Camilia, and Marcello. A few Swiss favorites are Gilbert, Hugo, and Claudia. Known for being a very large breed, the Saint Bernard is no stranger to size themed names. Clifford, Samson, and Diesel are a few of the more common selections. Other unique ideas come straight from rivers in the Swiss Alps. Rhone, Rhine, and Ticino are names that follow this theme. The Saint Bernard is well known for its search and rescue efforts at the Great St Bernard Pass. Honorable names inspired by this history are Medic and Rescue. Some of our pages will contain a subcategory. A subcategory is a slightly more specific grouping than the main topic of the page. For a subcategory, we will include a separated table of names and corresponding descriptions. An example of a subcategory of Red Dog Names would be 'Dog Names Inspired by Red Wines'. If you have any subcategory ideas for the Saint Bernard Names page, we would love to hear them. Use the form below to submit your ideas.